Lately the kids and I have been really into nature studies. I had several friends who kept writing blog posts about their nature studies, and I really wanted to do it, but their kids were older. Or they wrote about something we don’t have, snow, fruit bearing-trees, on and on. I had endless excuses. Then my friend over at Angellic Scalliwags started writing about their year long nature study. I started to think I could do that. 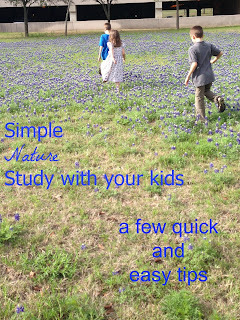 So let me give you my quick tips for a fun nature study with your kids. Don’t make it too complicated, all we do is go to the park, bring pencils, colored pencils, and a notebook. Then we write/draw what we observe. Give a specific thing to observe. If you turn the kids loose with look at nature, all you will get is your kids asking when they need to be done. So far we have chosen a tree to study, written down every living thing we could find, observed what happened to the park because of rain, and the list keeps getting bigger. Think small specific things. Set a short time limit. For my kids who are early elementary I have them work on it for 10 minutes. Then they’re done. Beyond that I get complaints, so if your kid is younger, maybe 5 minutes is enough. Let them also have some time to just play. I can tell you if the only reason we came to the park was to have a nature study and then we left, I’d have an open riot on my hands, instead give them time to play. Go to the same place multiple times. One, if you’re setting small specific tasks, then it will take multiple visits to study it all. Two, it changes. Just in the month we’ve been visiting a park, it’s changed a lot. 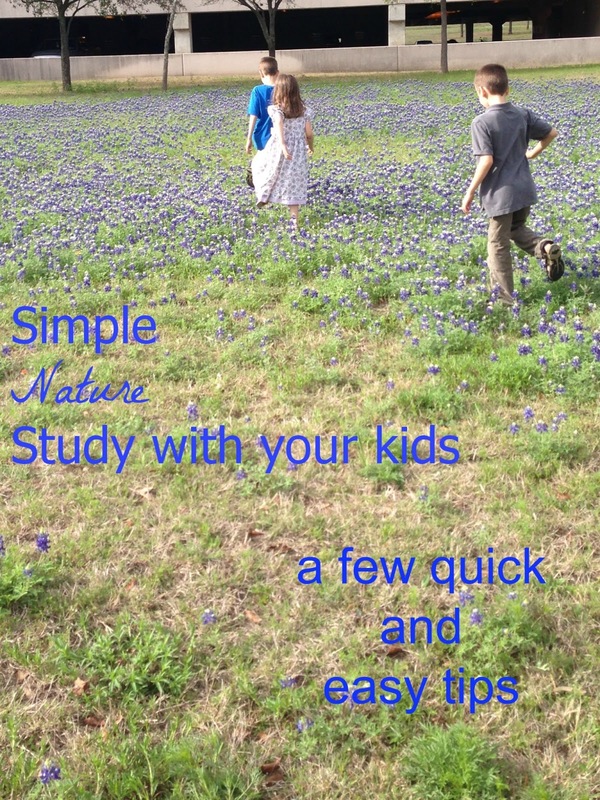 The more often you have a nature study, the more you kids will look forward to it. Our weekly trip is becoming one of the highlights of the week for the kids, I’m sure that has nothing to do with their getting wet there. If you can write and draw with your kids, they’ll see you’re doing it and enjoy it more. So, like they say on Dinosaur Train, “Get outside, and get into nature.” Have fun with it, not everything has to be serious (very little in my house is). I'm so happy to have Ticia from Adventures in Mommydom to my blog! Ticia is a former teacher turned homeschooling mom who is loving (and blogging about) all their homeschooling adventures! She is also working on a 2 year Bible curriculum; which you can find on her blog along with all the activities they have done to go with it! Hop over and check it out! You can find Ticia over at Adventures in Mommydom, or check out her facebook page, twitter, G+, and pinterest. Ticia blogs about their hands on learning adventures and how to make learning fun.